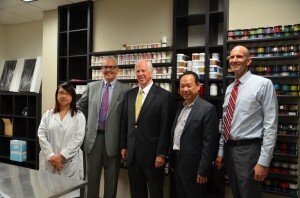 July 9, 2015 Walnut Creek, CA – Bay Area Development Company announces that its client, Hercules-based LECHAT, was recently visited by Congressman Mike Thompson (California District Five), officials from the US Department of Commerce and Principal Commercial Officer Jim Rigassio from U.S Consulate General Guangzhou, China. The visit took place on June 30 in LECHAT’s headquarters at 228 Linus Pauling Drive in Hercules and was part of an effort to help LECHAT and other U.S. companies freely sell their products in China. Founded in 1988 by Newton Luu and his wife, Jackie Truong, LECHAT is a wholesaler/distributor of its own line of nail care products, including acrylic nails, polishes, polish sealers and removers, manicure tools and more. Over the years, the company has seen exponential growth and now distributes its products to countries including Australia, Mexico, Germany, Russia and Israel. For some time Mr. Luu has wanted to include China in that list and invited Congressman Thompson and Mr. Rigassio to tour his facility and learn more about his company. LECHAT currently employs 17 people; double what it was just a few short years before. As LECHAT’s revenue and geographic reach have grown, so has its need for commercial real estate. In three separate projects spanning ten years, Mr. Luu turned to Joe Lampe, Senior Vice President at Bay Area Development, to help secure SBA 504 funding that would allow Luu to continue growing his company. In the most recent deal, LECHAT was able to purchase an 8,000 square foot building in Richmond, designated for the company’s storage and distribution needs. Bay Area Development teamed with Matt Hine of California Bank and Trust on the project and estimates that seven new, local jobs will be created as a result of LECHAT’s latest expansion. Founded in 1981, Bay Area Development Company is an SBA licensed lender that works with banks and the SBA’s 504 program to provide small and mid-sized companies with long-term commercial real estate financing. The loans have fixed, below-market interest rates and low down payments which allow businesses to purchase land and buildings, renovate existing facilities and acquire equipment. Headquartered in Walnut Creek, with an office in Los Angeles, Bay Area Development Company has provided more than $3 billion of needed capital to growing companies throughout California.